Thankful? You bet I am! Here it is Thanksgiving morning. 6:30 a.m. on the East Coast. I really need to spend the morning putting edits into the Mae Murray manuscript or researching my upcoming book about the lives, careers, and misfortunes of silent film actors. Instead, I think I’ll push back from the computer and take inventory of just how fortunate I am. Here is a photo I took several months ago. 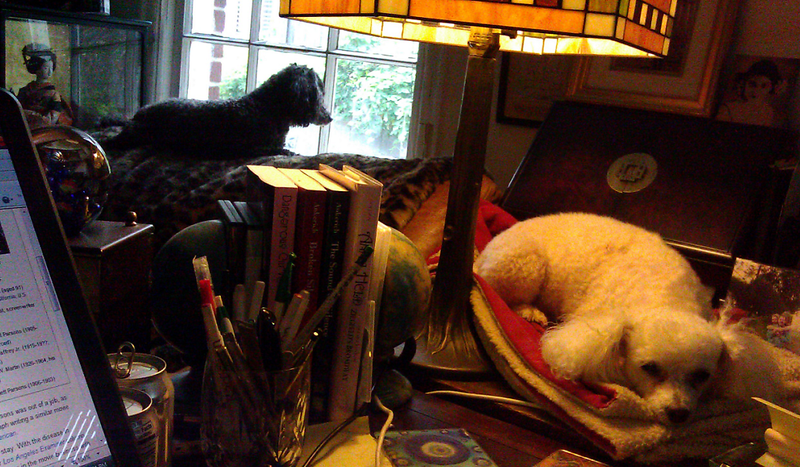 I was hard at work on the Mae Murray biography, but I took a break to look around at two of my poodle girls. They have patiently cheered me on during this long process. That’s Maebelle in the foreground. She and her sister, Miss Taylor (not pictured), turned 13 this year. Maebelle likes nothing more than to get into my lap and paw at the keys. I guess she’s trying to add her own flavor to the story. Tallulah is in the background, waiting not so patiently as Maebelle. Yeah, you guess it! We named her Tallulah after Ms. Bankhead. Tallulah’s full name is Tallulah Blackhead, and she lives up to her namesake. She just turned two and focuses her attention on getting outside in hopes of ripping and romping in the outdoors or lounging in her pool. I share this photo because it is a favorite of mine and because it reminds me how fortunate I am. It describes the peace I feel when I have my poodle puppies around me and the one I love reading or watching TV in the next room, patiently giving me the time I need to bring words to life. Thanksgiving! Thankful? You bet I am!